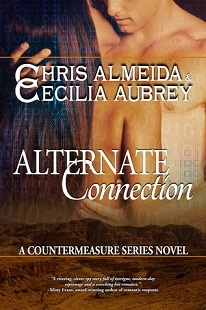 Allow me to introduce Alternate Connection, the long-awaited third installment in this rock-solid series from author duet Chris Almeida and Cecilia Aubrey. Don’t be fooled into thinking this is just another romantic suspense series, nor is it simply a romance: this is a deeply nuanced and twisty tale that manages to combine heart stopping action and emotion with possibilities that have readers scouring the pages for clues. A most definite read in series order title, you will want to start at the beginning to see the growth, the development and to understand the secondary, tertiary and even quinary sub-plots and relationships within. One of the most difficult reviews to write is one for a book that you loved, that moved you to tears (forget tears – full on sobs with hyperventilation and flails) for emotions stay hot, and it is hard to step back and be objective and informative without spoilers. The combination of action, emotional climax points, heartbreaking decisions and some hard won redemption for a character many thought lost just culminated in a 3 am crying jag of epic proportions. I’m still recovering as I struggle to form coherent sentences. The premise in this story is the extraction of 6 hostages from an attack on a convoy leaving the embassy compound in Israel. Nathan, a former colleague of Cassie’s and huge thorn in the paw of Trevor, is tasked to lead the teams with help from some deep undercover, super-charged military operatives. These guys make SEAL’s and Rangers look like kids playing at cowboys and Indians. Even worse, there’s a traitor on the American side, and only one of the hostages has an idea that the ‘kidnapping’ was staged. And, add insult to Nathan’s injured feelings – Trevor and his fellow geeky bloodhound George, have the ability to put eyes on the compound, trace digital imprints and hopefully find the mastermind before it is too late. We have the tension and action from the search and chase, the conflict between Trevor and Nathan, the guilt at Trevor’s leaving Cassie behind in Dublin, Nathan’s stubborn habit of refusing to think outside the box if it conflicts with “policy and procedure”, a Hawaiian-shirt wearing, tattooed smart aleck in Hanson, team leader of the military guys, Jessica about to pop with her and Stephen’s first child and guilt. OMG the guilt. Everyone is guilty about something here – all emotional, all based in their feelings of failure and letting someone down. The only one NOT guilty is George, back in the States working away at the NSA, and tossing nuggets of information at Trevor, managing satellite tracking while fending off teasing and pushes from Cassie, who consistently re-nicknames him (G-String being my personal favorite). Most telling in this story is Nathan. I’ve maintained that he needed a hug – or several – to make up for some horrible events in his past. Until this story, he had buried those issues, although he was acting out in often uncontrolled ways. Full of regret, guilt and what-ifs, Nathan’s opportunity for redemption is right at his fingertips, if he is ready to grab an opportunity at honesty and learn to forgive himself. For the first time we get to see what makes him tick, and I wanted to cry for him and all he had lost. But Almeida and Aubrey don’t take without giving, and he was given opportunities and a future with the one he always wanted. And a chance for a real friendship with Trevor, unlike the adversarial relationship that had alternated between repelling and drawing the two together. But it’s not all about Nathan: Stephan is about to have his carefully orchestrated world turned on end, yet again, by the arrival of his and Jessica’s first child. These two are adorable together, his own worries about their age difference is wiped out with Jessica’s every utterance and adoration. She’s no doormat, she challenges his moments of moodiness and withdrawal from her with her own unique approach, and these two are magically delicious. Circling back to George, this guy needs a relationship and a woman, and perhaps there is something in the works on the “swipe left” tip, whether or not he knows it yet. George is the worrywart of the bunch, able to break complex issues into their myriad parts with the speed of a multi-gig processor, his ability to speak reason to Trevor when his more adventurous and risk-taking side take precedence, he’s a great friend and work partner for Trevor. Lastly we dive into Cassie and Trevor. These two are magical together: not only is there a palpable electric attraction between them, but their friendship has grown and developed into a character that grows and breathes. You want to know these two, so solidly developed and presented that they fairly leap off the pages and sit at your desk, pushing you to read more, faster, again. The central characters that are the touchstone in each title, their relationship, while not perfect, epitomizes the support, respect and enjoyment that every couple should strive for. Alternate Connection is more than just a suspense story, or a steamy romance, or even an action-packed ride worthy of a top ten list. Characters arrive as complete people, functioning to the best of their ability on their own, with issues both hidden and more obvious. While it does carry threads from earlier titles forward, like all good series reads, the release of a new installment will fuel your desire to re-read the earlier titles. Fortunately with the full length titles (now 3) and multiple smaller bits and bytes that focus on one couple or person for a short moment in time, there are hours of reading to escape with. CIA Operative Nathan Nelson has built his life on secrets, especially those that have shaped the man he is--secret feelings for a woman he is viewed as off-limits for a decade and events that taught him to keep his shields up. Now, those secrets come barreling down on him at the worst time. Foreign Service Specialist Rachael Moore is personal crusade puts her in the cross-hairs of very dangerous people. She has risked her life to free herself from the past and in doing so, exposed her battered heart and deeply concealed dreams to the man who once told her he would never touch her. Bits and Bytes of Life. A copy of this title was provided via Publisher via Substance B for purpose of honest review. I was not compensated for this review: all conclusions are my own responsibility.